“Prohibited persons” may not possess firearms or ammunition. It is also unlawful to knowingly give a prohibited person firearms or ammunition. Those restrictions seems straight-forward, but there are unique definitions and exceptions that apply. These details should be understood so that you know exactly who is a prohibed person and precisely what they are prohibited from possessing. what to do if you are a prohibited person. Who is a Prohibited Person? The definition of who is a prohibited person includes many categories of people. The definition of a “prohibited person” is included below. Some of the categories, like “felons,” are simple. 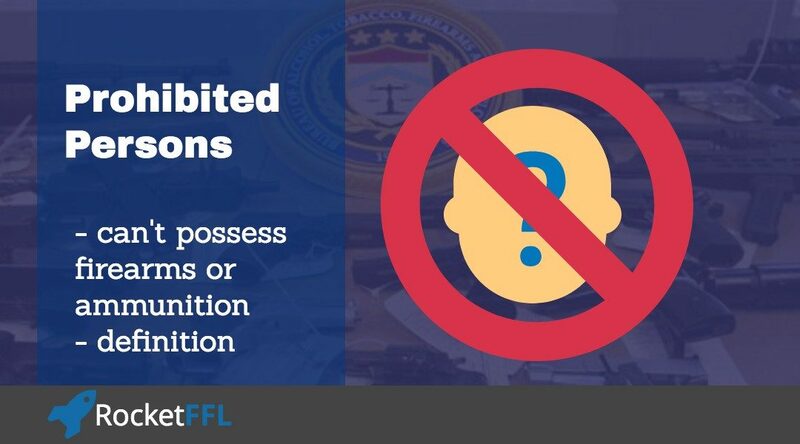 If someone is a felon, then they are prohibited from possessing firearms or ammunition. Other categories, however, aren’t so clear and have specific details which are included below. Generally, crimes punishable by over a year in prison are felonies. All felons are prohibited persons. However, there are some misdemeanors that can have a punishment over a year in prison – especially repeat offenses. This can be tricky. For example, if a person has been convicted of a misdemeanor that has a listed punishment of 1 – 14 months in prison and the person’s sentence didn’t include any jail time, then they are still a prohibited person because they were convicted of a crime that was punishable (whether or not they received the punishment) by over a year in prison. With the recent legalization/de-criminalization of marijuana in some states, the use of a controlled substance part of the prohibited person definition is going to become a bigger issue. Remember, just because your state may allow you to smoke marijuana, the federal government doesn’t (yet). Use of marijuana, although not unlawful at the state level, may still make you a prohibited person. Be careful. It is important to note that this is the federal definition only – some states have stricter definitions on what firearms are and who is prohibited from possessing them. The basic definition of a firearm is: “any weapon (including a starter gun) which will or is designed to or may readily be converted to expel a projectile by the action of an explosive.” In simpler terms, this means that if a projectile (bullet) is shot out of it because of an explosion (gun powder), then the object is a firearm. It is not just the complete gun that counts as a firearm – the frame or receiver (or any object that can be readily converted into a frame or receiver) is also considered to be a firearm even though it can’t fire a projectile by itself. Be careful here – this means that certain parts of a gun are treated as if they were complete firearms / guns. Also, silencers and “destructive devices” (grenades, explosive projectiles, etc.) are included in the federal definition of a firearm. These additional parts of the definition aren’t worth discussing in this guide, however, because if you are not permitted to possess a shotgun, you clearly aren’t allowed to posses silencers and grenades. There are some exceptions to this definition. For example, black powder / muzzle-loading firearms aren’t technically “firearms” within the definition of federal law because they are exempted as “antique” firearms even though they may have been manufactured yesterday. Air rifles (pellet guns, BB guns, etc.) are not firearms under federal law because they fire a projectile with compressed air and not an explosion. Be careful with air rifles – some states define them as firearms. The term “‘ammunition’ means ammunition or cartridge cases, primers, bullets, or propellent powder designed for use in any firearm.” This means that every part of a cartridge of ammunition is considered “ammunition.” Therefore, if a prohibited person is in possession of just an empty shell casing, then they can be in trouble. This is a likely area for trouble. A prohibited person likely knows to get rid of their guns, but they may forget to get rid of all of their ammunition as well. If you are a prohibited person, stay away from firearms for as long as you remain a prohibited person. Possession of a firearm is enough to get you into trouble – it doesn’t have to be your firearm. Also, be extremely careful near firearms even if you’re not physically holding one. Depending on the situation, having access to a nearby firearm might be enough to get you into trouble. If you want to regain your right to possess a firearm, you should contact an attorney in the state where the event happened that keeps you from possessing firearms. You may be able to overturn your status as a prohibited person. It is rare, but it can happen. Whatever you do, do NOT try to have someone else get a firearm or ammunition for you. This is a straw purchase and will get you BOTH in serious trouble.